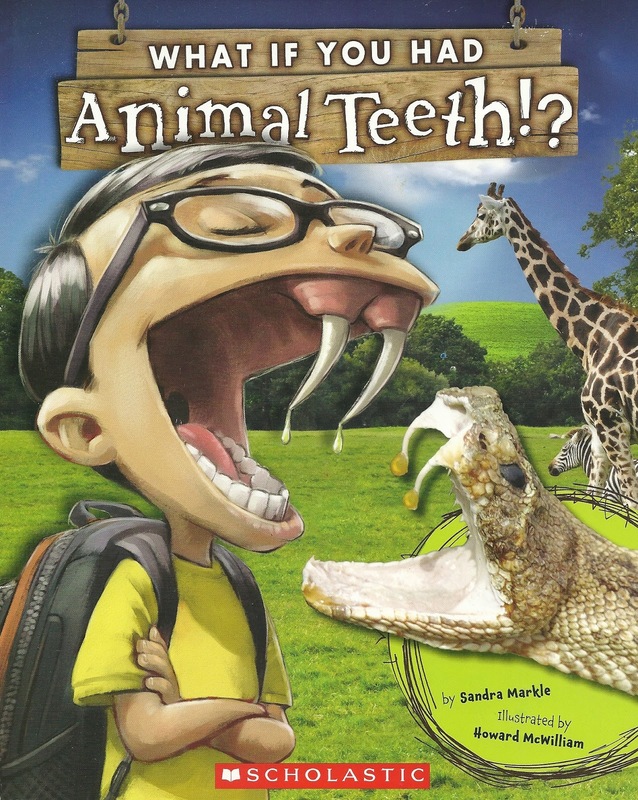 I frequently use mentor texts in the classroom, and students find them incredibly valuable as exemplars for their own writing. But how many times have I asked, "Do you remember when we saw examples of this technique in one of our mentor texts?" only to be met with blank stares. Or worse, a student will say, "I remember in one of our picture books the author did this thing where she said something in a way that was cool and can you help me find that book?" So this year, in an effort to maximize our engagement with mentor texts, I began to create Mentor Text Display Cards. 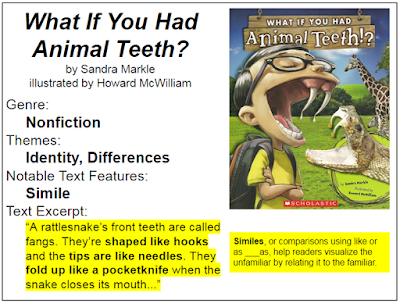 For each exemplar text we study, whether it be a picture book, poem, article, or excerpt from a novel, I've posted a simple letter-size display card listing the book title, author, illustrator, genre, theme, notable text features, and a text excerpt (see example below). On a bookshelf adjacent to this display, I've shelved all of the mentor texts we've already read, as well as those I intend to use in the near future. During free reading time, students will return to these texts since they're familiar and meaningful. Students struggling to recall text features or literary devices will look to these cards for help. Students now make discoveries of their own in their independent texts, and some have even suggested picture books and excerpts for future sharing. This, in itself, is remarkably revealing, because some students are pointing out features and literary devices that haven't been formally introduced through our other texts. The collection of cards serves as clear evidence of our classroom goal to create a common culture of literacy, while recognizing unique attributes of each text that we share. While I created the first few cards, I see no reason why future cards can't be made by students themselves. The blank prototype card I've provided is easy to duplicate and edit. After reviewing the cards I've shared, you may also decide that what I've chosen to illustrate on my cards doesn't quite serve your purposes, so I welcome you to customize them as you see fit. If you're a Google Docs user, simply open the link that I've shared, click on File in the top menu, and choose Make a Copy to create your own editable set of cards. Printed out, these cards can be inserted in the books they reference. That way, even if you choose not to use a book in a given year, a student can still benefit from the information the card provides. Individual cards can be saved as pdf files, and these can be digitally stored for student access. My own teacher website has an index that would work well with this concept. I chose to post my cards chronologically, since students will remember a book that was read "a long time ago" (two weeks ago!) and find it easier to reference if the cards are posted by occurrence. But I can also see posting cards closer to those shelves that they might reference. So my New York's Bravest card might be posted adjacent to the Tall Tale section of my class library, and my George Bellows: Painter with a Punch card might be located near the biography section. As students read their own picture books (see the biography book reports here, for example), they can create their own display cards to illustrate the "take-aways" of their individual texts. Via Google slides I've provided you several cards to get started (all the books on these cards have been featured on this blog), including a blank prototype for editing online, as well as a blank that can be printed out if you prefer students to create a card using paper and pencil. Again, you will need to open the link, click on File in the top menu, and choose Make a Copy to create your own editable set of cards. How Big is It? summary and activities. I'd love to hear your ideas for these cards, as well as ways you plan to customize them for your own classroom.